New Release on Sale ! "All That Glitters " is the New Album from Pietra Wexstun & Hecate's Angels. 11 new songs. A 16 page booklet with full lyrics and credits. A treasure trove of new tunes and mysterious stories from the "sonic sorceress." 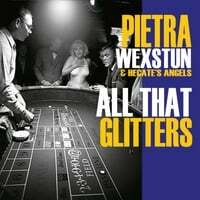 "All That Glitters "is the latest album from Pietra Wexstun & Hecate's Angels. New work from the vocalist/composer and her band of underground explorers. LA based Hecate's Angels have an arty, futuristic cabaret sound, based around the creative vision of musician Pietra Wexstun (responsible for vocals, keyboards, autoharp and dulcimer, with songwriting and production throughout) and augmented by instrumentation including wind, strings, guitar, and diverse percussion. You'll see strange mythic pictures in your mind, go back in time, speak in tongues and then wonder who slipped that great mickey in your hi-ball glass." I recommend buying the CD with lyrics, photos and a really cool design. This is a trip you'll want to keep taking. Sonic and lyrical magic throughout.